I wanted something a little different in the appetizer selection at the holidays this year, especially since I have so many appetizer recipes I have yet to try. 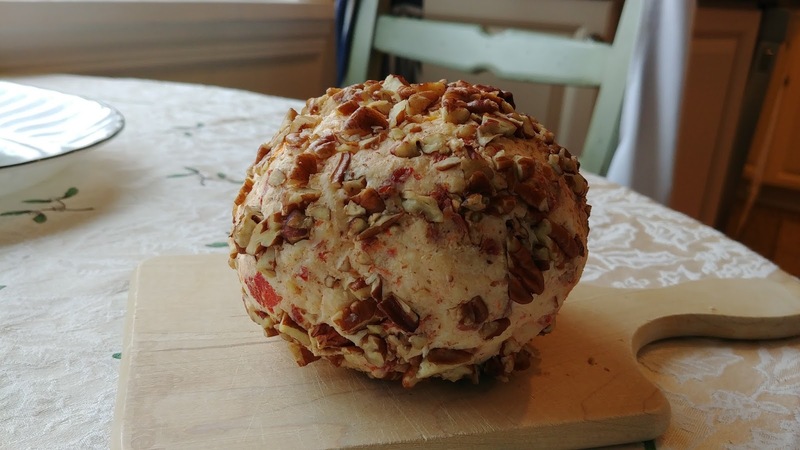 So I decided this would be the Year of the Cheese Log (or ball, which is easier to shape). I've had this recipe for Gouda Cheese Logs forever. 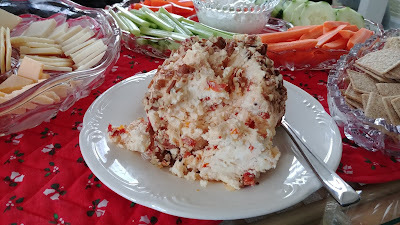 Like the Roasted Red Pepper & Artichoke Dip, it was ripped from one of my old cookbooks/recipe books, one of those small, paperback ones, like what you sometimes see (or used to see) in check out lines. Cheese logs/balls seem kind of old school, but I always liked them. Not the nuts they were frequently coated with, but the creamy, cheesy, spreadable blob of cheese itself. So we made one, the same one, for Thanksgiving and for Christmas Eve. 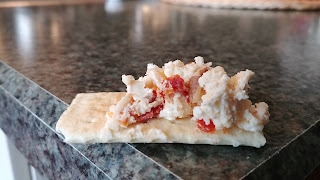 It's super easy: shred the block of gouda in the food processor (or by hand, or buy already shredded gouda, which I've never seen but MIL told me she bought it), combine with cream cheese (easier in food processor or with electric mixer but SP did the Christmas Eve one by hand), stir in chopped sun dried-tomatoes, enjoy. We did coat ours in some chopped pecans which I, of course, picked off. I love this cheese ball. Mild gouda, creamy from the cream cheese, tangy from the sun-dried tomatoes, a little crunch from the pecans. It's also very good on sandwiches/panini or with celery/carrot sticks or just eaten by the spoonful. We'll be making this again. Mix cream cheese & Gouda cheese until blended. Stir in chives, tomatoes, and garlic powder. Shape into 2 small logs or 1 large ball. Roll in parsley or in chopped pecans. You could also omit the chives in the cheese mixture and roll the logs/ball in the chives instead. Wrap in plastic wrap and refrigerate at least 2 hours until firm. These can be stored in the refrigerator for up to 2 weeks. Make sure to let it sit out for at least an hour to soften before serving. *We omitted because we didn't have fresh and dried chives aren't that great. **We omitted because we don't have.